Why is it important to work with Eating Disorder Therapists who specialize in the treatment of Eating Disorders? If you or someone you love is searching for help for an eating disorder, it may feel confusing to determine where to start. 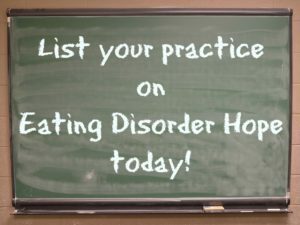 Given the complexities of eating disorders, it is important to seek out Eating Disorder Therapists who specialize in the treatment of eating disorders. Specialists in eating disorder treatment, such as licensed therapists and psychologists, will have experience in dealing with the issues that lie behind eating disorders. Professionals who specialize in eating disorders will also have education specific to this field that gives them advance knowledge and understanding over general therapists and counselors. Another reason it is helpful to seek out a specialist is that professionals in this field are updated on the latest treatment techniques and will have a more complete and thorough knowledge of the approaches required to initiate the recovery process. When searching for a treatment professional, it is important to keep in mind that you must feel comfortable with whatever therapist or eating disorder specialist you choose. Eating Disorder Therapists: These professionals facilitate therapy sessions and may practice various forms of psychotherapy, such as Cognitive Behavioral Therapy, Dialectical Behavioral Therapy, Family-Based Therapy, and more. An eating disorder therapist may also treat co-occurring disorders in their practice. Registered Dietitians: These professionals specialize in nutrition rehabilitation and work with individuals to create and maintain a balanced meal plan. A Registered Dietitian would also oversee Medical Nutrition Therapy for men and women recovering from eating disorders. Eating Disorder Psychiatrists: These health professionals prescribe medications and manage drug therapy. Physicians who specialize in treating eating disorders: These professionals supervise and oversee any medical complications that may have resulted from the eating disorder, such as heart conditions, electrolyte imbalances, etc. Does the eating disorder counselor or therapist treat primarily clients/patients with eating disorders? What is the experience with eating disorders? Are co-occurring disorders also addressed and simultaneously treated if necessary? Is the eating disorder specialist accredited? Degree accreditations for eating disorders therapists and counselors to look for may include an LCPC (Licensed Clinical Professional Counselor) or LCSW (Licensed Clinical Social Worker). Psychiatrists and physicians should hold medical degrees. Is the eating disorders specialist a member of prominent eating disorder organizations, such as the Academy of Eating Disorders of the International Association of Eating Disorder Professionals? What is the approach used in therapy? Does the specialist already work with a team of other professionals [eating disorder psychiatrists or dietitians]? Does the specialist have a long-term treatment plan to help you get well and stay well? Research has demonstrated that the most effective way to treat an eating disorder is with a comprehensive team of health professionals that specialize in eating disorders. Since eating disorders are multi-faceted and involve varying complexities, such as nutritional imbalances, medical complications, and psychological issues, it is critical to have a team of professionals that can address each of these concerns. Working together to integrate treatments across disciplines yields the best results for eating disorder recovery. In order to establish a treatment team for your recovery, it is best to start with a primary care physician or licensed therapist who specializes in eating disorders. These professionals, who are knowledgeable about the process of treatment, can assess individual needs and refer to other health professionals as necessary, such as Registered Dietitians or Psychiatrists. Each specialist will collaborate together in working towards the central goal of healing and recovery from the eating disorder. Once you have found the professionals you will be working with and a core treatment team, it is helpful to devise a treatment and long-term recovery plan. Your treatment team, which will most likely include a family doctor, nutritionist, therapist, and psychiatrist, will work together with you to develop a plan that’s individualized in meeting your needs. Components of your treatment plan may include types of psychotherapy, eating disorder education, nutritional counseling, and medical monitoring. Your treatment team may ultimately recommend that you seek higher levels of care at residential or inpatient eating disorder centers before continuing outpatient treatment. Experts in the field of Eating Disorders are available for speaking engagements. These professional speakers are leaders in the field of eating disorders who provide informative and engaging presentations. You can find engaging speakers for your event here! Useful for colleges, schools, conferences and other gatherings where eating disorder information is needed. 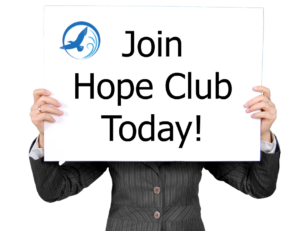 Take a moment to review Eating Disorder Hope’s Speaker Bureau page.